Jon Hare's Sociable Soccer is in development for the Nintendo Switch. Hare is best known as one of the co-founders of Sensible Software, the legendary UK code shop responsible for Sensible Soccer and Cannon Fodder. Sociable Soccer is billed as a spiritual successor to the former, a game which is still considered by many to be one of the finest virtual representations of the sport even made. At Gamescom there was a Switch game that was not available to be seen by the public, only to staff and investors behind closed doors. It's name is "Sociable Soccer". Designed by the very same man that designed "Sensible Soccer" and "Cannon Fodder" all those years ago that were both huge hits during the 16-bit era. I was shown the game briefly and recorded this footage using my Mobile Phone. It's releasing on Steam via Early Access in October sometime but to see a Switch version up and running too is very exciting. Switch owners will be pleased to know that it's the exact same version they'll be getting for their Switch when it eventually releases. Sociable Soccer first made headlines in 2015 when it launched on Kickstarter but the campaign was pulled after a disappointing start. Hare and his team insisted that development would continue regardless and now have the game on Steam Early Access. It features more than 1,000 teams and 30,000 players, all totally editable, and both online and offline play is promised. Thanks to Thomas White for the tip! Ball trails looks awful, please fix (remove them). 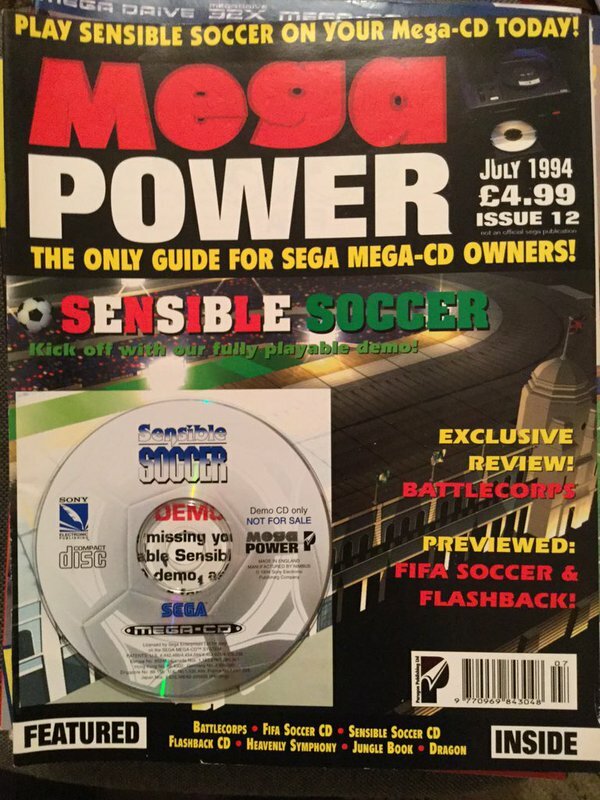 Many hours wasted playing the Mega Drive version of Sensible Soccer with mates in the 90s. Might keep an eye out for this one. Also bring back Cannon Fodder! Headline could have used a set of commas, but high-five on the alliteration. Soccer is an intense competitive physical sport. As it is team based, I guess you need to be somewhat sociable to take part, but is it really about socializing? Anyway, Sensible Soccer, the rational choice for sensible people, was always good fun, and I welcome competition to FIFA. Loved sensible and then sensible world on my Amiga. Damn that game was my whole childhood. Not sure if they can recreate that OMG feeling in 2017 though. I loved Sensible Soccer. Don't like the title of this game but when I think about it "sensible" was a silly title word too. I absolutely loved Sensible Soccer back in the day.I would be one seriously happy man if this turns out to be at least as good as the originals.Knowing it's by the same guy should give me confidence it will be but Dino Dino's Kick Off Revival was a disaster. I had the Megadrive version and then later a free demo disc for the Mega CD.Possibly the greatest demo disc ever in fact.It was the full game but matches were limited to 90 seconds,which for a game like this is only 30 seconds short of being perfect.I couldn't believe my luck with that,I played that demo more than any other game on my Mega CD. Every copy should come packaged with two Zipsticks. @kobashi100 I guess it's the nearest they could get to Sensible Soccer without using the name. Think Codemasters owns that trademark. @SLIGEACH_EIRE It was made by Sensible Software. Fifa just lost my sale. I wonder if this is why it is being kept quiet. This looks exactly what I'm looking for. Pick up and play arcade fun. Two player table top mode is also ideal. Also should be less than the £45 EA are charging! "Switch owners will be pleased to know that it's the exact same version they'll be getting for their Switch when it eventually releases." @Woodyshoe yep in agreement. Just waiting for this now. Sociable Soccer.. Meh.. I did enjoy it as a kid, but as a grown up who tends to play games alone, rather than in a Sociable environment, I'm not sure it'd ever get enjoyed as much as the older games..
Now, if they did a "Common Fragger", I'd be first to pick it up. Holly broken zipsticks! Sensible (World Of) Soccer is one of the most perfect gamesI've played. There can't be a better game to show of the Switch's local multiplayer strengths than this if it's good. Me and my pals spent countless hours either playing solo on career mode or together in epic winner stays on sessions. Brings back sweet memories of Newcastle being good and that summer of Euro 96 when we'd all finished our GCSE's. I just watched the trailer to this and when the 'Goal scoring super star hero' theme drifted in at the end I got goosebumps! I agree about the ball trails - I hope they can be switched off as they're really distracting and unnecessary. I wonder if they're showing the game off with them so people can see the awesome swerve on the ball - I used to be able to score from the touchline just past the half way line with John Barnes in the original SS with it. Really hope this game fulfils the promise of being made by one of the original Sensible guys. They made some great games that didn't quite have the polish of Nintendo - but definitely had a similar attitude towards playability and fun - and a very British version of the weirdness and sense of humour. I'm getting seriously tempted by a Switch now - Mario is not helping - and now this!! I will admit that doesn't sound terribly exciting to the uninitiated. I've longed for a remake of Sensible Soccer for years & years and it looks like this could finally be it. Oh yeah! Was hoping this would come to Switch. I dread to think how many hours my mates and I spent playing Sensible Soccer back in the day. I'll say one thing though, every single minute was pure fun. Codemasters should just release the original game with somewhat updated graphics and online multiplayer. Social Butterfly... wait, Social Soccer ?! @Priceless_Spork Indeed, some of the most intense games end in a 0-0 tie. Yes this is all well and good, but what about the important stuff all football games need, like the cloth/hair physics and the sweat? Whoa, nice. Being able to play this portable would almost make up for NA never getting Nintendo Pocket Football Club. I was never a fan of this, don't like the new game either (as far as I can tell). Sensible Soccer is probably my favorite football game. Spent many an hour on my beloved Amiga playing Sensi!